Saloca in Wonderland: How I grew my Pinterest engagement to 90k in 3 months! How I grew my Pinterest engagement to 90k in 3 months! Pinterest is the way forward when it comes to driving traffic back to your blog. But how do you boost your Pinterest engagement to start benefitting you, your brand and your blog? 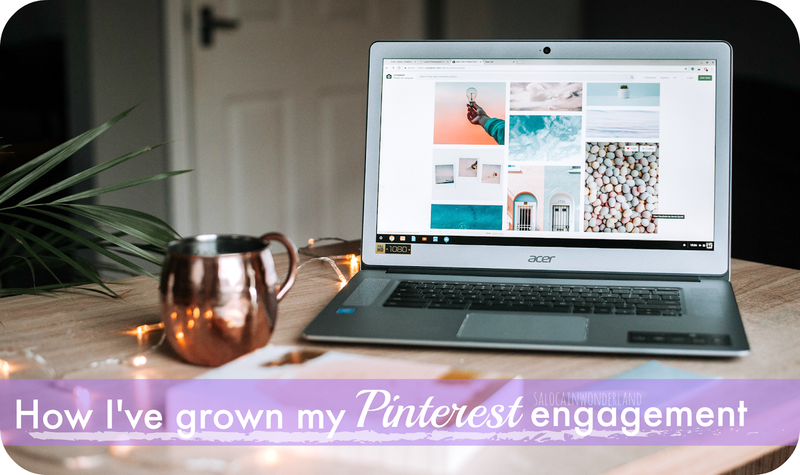 With a little Pinterest research and a few minutes a day, I’ve managed to grow my Pinterest engagement to over 90,000 in 3 months! With and without Tailwind. 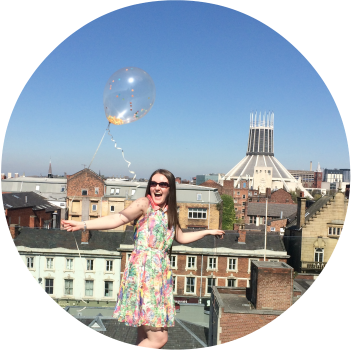 Why do you need Pinterest as a blogger? Next to Google, Pinterest is the biggest traffic source. Humans are visual people, and if you can grab them with a graphic, you’ve got them clicking through to your blog in no time. But in order to drive that traffic back to your blog, you need a couple of things. I won’t go into too much detail as this could be a post in it’s own right, but Pinterest is SEO (search engine optimisation) friendly, and it’s this SEO that helps people find your pins. So you need you Pinterest image names, alt tags and descriptions to all be SEO friendly. Not only do you want your pins to be SEO friendly, but you want your account page to be SEO friendly too, this includes your account name and bio. When people search for you, you want them to find you and your brand. Active accounts mean the pins they’re pinning are more likely to show up on a users Pinterest home page. The more often you pin, the more home pages you are going to show up on. So people see what you’re pinning, they see your account, they may click through and engage with your content. Again, something I could go into a hell of a lot more detail about but in it’s simplest terms, Pinterest is the place to work on your visual branding for your blog and business. You want cohesive pins and streamlined colour palettes. You want your pins to be instantly recognisable. Full disclaimer here, but at present, I do not use any group boards (though they’re next in my plan of Pinterest attack). So this has all been done by me, myself and I. I don’t spend more than half an hour a day on Pinterest now, and I’m seeing an engagement growth of 1k - 3k per day. I spend a little more time on Pinterest at the weekend, but it’s never more than an hour! Tailwind and a few interesting posts from my blogging Guru Corinne over at SkinnedCarTree are what opened my eyes to the possibilities of Pinterest for Blogging. Tailwind is a scheduling app that will schedule and pin pins to selected boards at specified times. Tailwind will automatically generate the best times for pinning to your account based on your audiences activity. Oddly enough, my audience seems to be most engaged between midnight and 6am - and there’s no chance I’m getting up that early just to pin! You can trial Tailwind for 100 scheduled pins free. Guys, these 100 pins where absolute game changers! I went from under 1k engagement to close to 20k engagement in as few as 100 pins! I would highly recommend you check out the free trial just to get a feel of the numbers I’m talking about. One thing I didn’t get to experience was the most popular feature - Tribes. Tribes are group boards, but it seems to be one of the best organised, and most efficient ways of finding and using group boards where your content does get re-pinned. Growing Pinterest engagement without Tailwind. If, like me, your Tailwind free trial has run out, that does not spell the end for your Pinterest growth. One of the key things I’ve come to discover since my trial ended over a month ago now, is as long as you keep your account active, you will still see growth. For example, I tend to click onto Pinterest first thing in the morning and Pin 5 - 10 things to my boards. For every 5 pins I pin, I will pin 2 of my own pins linking directly back to my blog. Pinterest will penalise you if you are only pinning your own content from the one web address, so don’t shoot yourself in the foot - share the love! I’ll click back on over lunch time and do the same thing again, 5 - 10 pins, with a few of my own thrown in. Sometimes I’ll pin multiple things, but what I prefer to do is look at my boards, see which one needs a little love, or even just what I’m in the mood to look at, and pin specifically themed things to that board. You don’t want to just be pinning trash for the sake of it, you want you’re account to look real. Speaking of boards, get them organised. Not only will this help you, but any new potential followers who stumble across your profile page will be drawn into well organised, thought out boards. I know I am - and I’m my target audience, so if it appeals to me, I want it to appeal to others. Again, in the evening, rinse and repeat. I’ve spent about 30 mins total during the day, pinned around 15 - 30 pins, and this seems to keep my engagement growth ticking over quite nicely. I've managed to get over 70k engagement pinning without Tailwind. Should you pay for a Tailwind membership? Right now, a years membership to Tailwind is coming in at close to £100. That’s a big investment for a hobby blogger. But, one thing I am noticing is that although my engagement is growing, the re-pinning of my own content and follower growth is very slow. I’m seeing a handful of clicks a week coming through to the blog, but nothing to write a post about. I feel like Tailwind Tribes would help me grow in this department, but is it worth the £100 investment? I can see myself doing this at some point this year, unless click through and followers start to grow before I take that plunge. This whole new love for Pinterest has actually got me loving creating content more too. I’m thinking more about the visuals, something I’v never paid as much attention to before as I have the content of the post. I’m finally getting a feel for my own visual branding and I’m even enjoying creating more Pinnable graphic content for my latest posts. Do you give any time to Pinterest as a traffic source? Well done!! That's impressive work. I haven't used Pinterest much. It's one of those things I keep saying I'll use but never do. £100 is a bit much for a scheduling tool that might bring views or not, at least for me. I totally agree about £100 being too much for a scheduling tool! I'm hoping I can find a way around this BUT if it does help generate page views, which then generate an income, hopefully it will just pay for itself one day! That's the dream anyway hehe!